"A jewel from the Crimson Maple collection is 'February Blessing' with its delicate and warm, enchanting tonality. A modulation serves to enhance the simple and graceful melody beautifully. There is teacher and student appeal in pieces that challenge a student’s technique as well as one that clearly tells a humorous story. I am thrilled to have these additions to my teaching repertoire! I know they will be a hit with students – especially teenagers and adults." "Lynette’s music has a lyrical quality reminiscent of the quintessentially Canadian style of Hagood Hardy. Her evocative, charming, and, at times, amusing images easily inspire students in the creative musical process. This collection is a 'must-have' in every teacher’s library and a delight for performers and audiences alike." "Lynette Sawatsky’s music is consistently full of gorgeous lyrical melodies and complimentary, flowing harmonies. 'Springtime' stands out as a favorite from her collection Seasons Change with its gentle left hand and elegant right hand lines. Together with the harmonies, it evokes a sense of joy and the anticipation of new life." 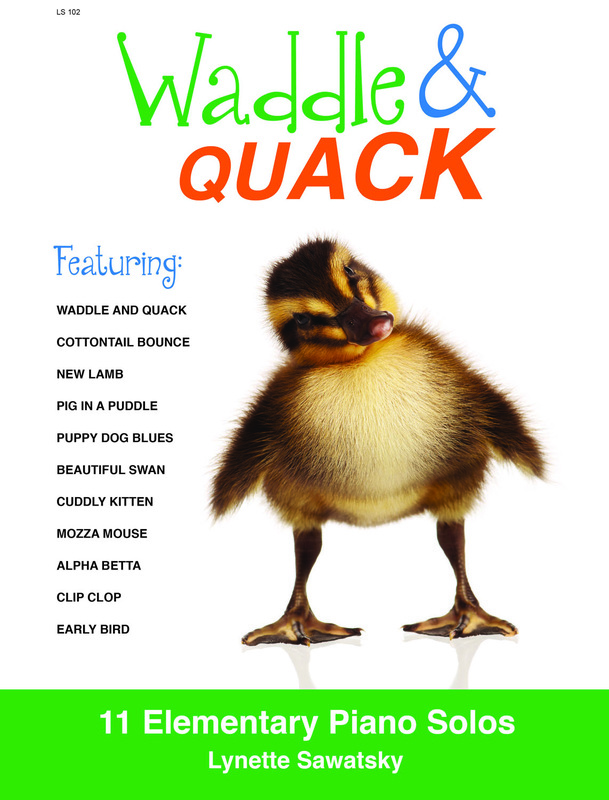 "Students will easily fall in love with the imaginative animal characters and enjoy the programmatic elements such as the tongue clicks of Clip Clop, the glissandos of Beautiful Swan, the accompanying lyrics to Pig in a Puddle, and the black key rolls of Mozza Mouse. The variety of styles from jazz to pentatonic and attention to full use of the keyboard make it a very effective teaching tool. When I presented this book to my students, they were immediately drawn in by the beautiful artistic illustrations which accompany each piece. It is evident that much care and attention has gone into the production of this new book to make it a delight for young students and encourage their musical growth." "This delightful collection is perfect for the young beginner who is looking for recital or festival repertoire. Titles are creative and engaging. Complete with colouring pages, your young student will want to be purchasing their own book as a keepsake. Each piece has easy-to-follow patterns, and even the youngest beginner can find something to learn and enjoy. Parents will be thrilled with the musicality their child suddenly possesses when they hear Beautiful Swan, complete with triplets and pedal! This will be a collection you return to lesson after lesson as students will want to learn each piece in the book."